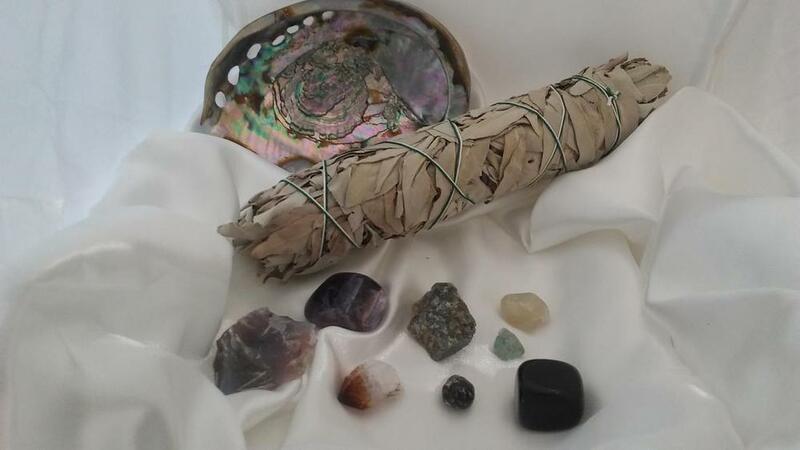 Deluxe Collection - Citrine, Agate, Amethyst, Apache Tear, Aquamarine, Labradorite, Moonstone, Obsidian, & a Abalone Shell & Sage Bundle or a Palo Santo Pack. Energizes every level of life. Cleanses the chakras. Opens the intuition. Attracts wealth, prosperity, & success. Imparts joy, wonder, delight, & enthusiasm. Raises self-esteem & self-confidence. Stimulates the brain, strengthening the intellect. Promotes motivation, activates creativity & encourages self-expression. Enhances concentration & revitalizes the mind. Releases negative traits, depression, fears, & phobias. Emotionally balancing.